The Rotary Club of Greensboro is one of the earliest Rotary clubs, founded in January 1917, twelve years after the founding of the first Rotary club. From the first 42 members, our club is one of the largest with 240 members. Our membership includes a broad cross-section of our community and spans a range of ages, backgrounds, interests, and occupations. Diversity is one of our greatest strengths. 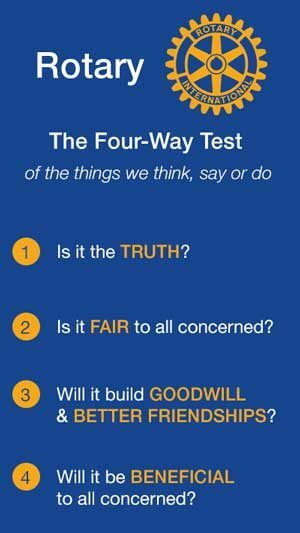 The Four-Way Test is the foundation for all we do in the club and “Service Above Self” is our constant goal. Our members contribute their time, talent, and leadership skills to our community in a variety of ways in numerous organizations. We offer many opportunities in the club to get involved – the best way to be a Rotarian. Fellowship and camaraderie are also important to us and we enjoy celebrating together, laughing together, and offering expressions of care and concern for members facing the challenges that life brings. Greensboro Rotary meets every Wednesday from 12:30 to 1:30 (sharp!) in the Terrace at the Greensboro Coliseum on W. Gate City Blvd. Lunch is served beginning at noon. We welcome visiting Rotarians and guests. There is a $15.00 charge for guests. Please take the opportunity to explore this website and learn more about Greensboro Rotary – and then come visit us on Wednesdays. Click here to see the Rotary Club of Greensboro Committees and Chairs.